After an exhaustive search, my husband's "canoe envelope" has finally been emptied. He's saved for months. He's endured more just-missed-it classified ad calls than I can count. I finally pushed him to Bass Pro last weekend with instructions "Buy whatever you want. There's obviously a hot resale market for canoes here. Just make sure you get it before the baby comes." To his dismay, Bass Pro had sold out of every single model. How's that for timing? He rushed out the door at 6 am, certain to be the first shopper at the only yard sale that vaguely advertised canoe. The seller scratched his head and said, "$350?" My husband offered $200, hoping to meet in the middle. After conferring with his wife, the seller agreed to take his first offer! He even included the foam mounting blocks ($30 at Bass Pro) and four paddles. I am so glad the saga is over. Wow! That's a great price on the canoe! My DH would be jealous! Was the canoe in pretty good shape? Where does one canoe in the Nashville area, anyway? Are there lots of streams and lakes etc. down there? 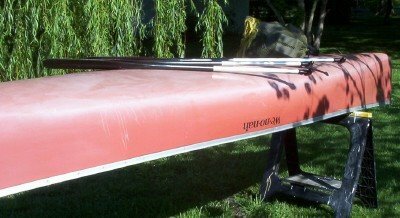 Yes, the canoe is in great shape, a step up in quality from entry-level canoes that retail for about $300. Middle Tennessee is full of lakes, rivers, and small streams for canoeing. We live within a few minutes of a popular canoeing river, and a canoe will give us access to better fly fishing spots on stocked trout streams a couple of hours away. Canoe rental is about $50 a daytrip, so it will pay for itself within a few uses. Getting to go with his dad will be valuable leverage for Andrew's swim lessons this summer! Sounds like your husband is a smart shopper too! I'm happy for you both on getting such a great deal!